This six wheeled brake was built as late as 1950 at Stratford works, to a design that is clearly Thompson in origin. 84 of these unusual vans were built probably from parts made at other works and lying spare (there seems little other reason for introducing a new van type at this time). They were the last six wheeled carriages built for use on Britain's railways. 70654E led an uneventful life; trundling around the Eastern region carrying parcels until the late 1970's when most non standard van types were withdrawn. Many of these vehicles entered preservation, and 70654E was privately purchased and moved to the GCR. 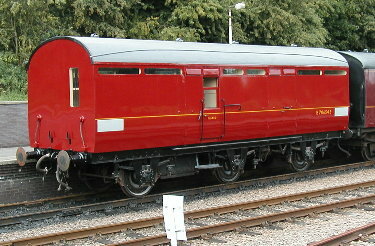 Repainted maroon (a livery it doesn't seemed to have carried before, being built in crimson and repainted rail blue by BR) it ran on the GCR from 1981 until 1990. Unfortunatley its owner then passed away and it fell into disuse for the next 10 years. By this time all but one of the other preserved BZs had been dismantled, generally so the underframes could be used under much older vehicles. RVP therefore sought to acquire it, and immediately embarked on a major restoration program to make it the only restored example of its type. Its condition proved worse than we imagined - three years later the finished vehicle has about 80% new framing and entirely new steel panelling - it is literally as new. Its rebuild was so extensive that it won a Transport Trust award for restoration in 2003 - our first national award.